Trump’s demand for a border wall has spotlighted migration from Mexico and Central America, and although apprehensions at the Southwest border are far lower than they were 15 years ago, there's lately been an upward spike of people trying to cross into the U.S.—including a record number of families. These numbers point to a deep crisis in the region. 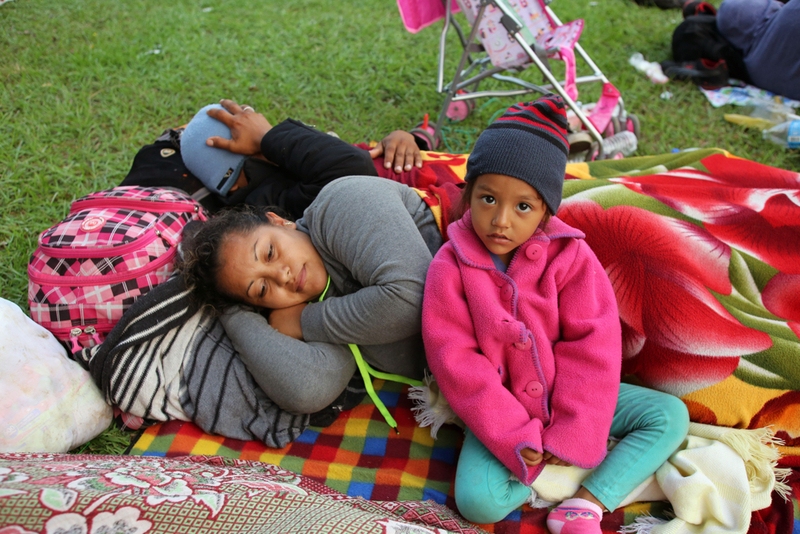 Endemic crime, violence, human rights abuses and economic inequality continue to push Mexicans and Central Americans to flee to the U.S. and other countries. The region’s intentional homicide rates are enough to give pause. According to the most recent data from the United Nations Office on Drugs and Crime, in 2016 the homicide rates per 100,000 population were: 83 in El Salvador; 57 in Honduras; 27 in Guatemala; and 19 in Mexico. In 2018, Mexico experienced its highest number of homicides since record keeping began in 1997. Although these crimes are primarily perpetrated by organized crime cartels and gangs, the militarized response by governments has only exacerbated the problem. Since the beginning of the Mexican government’s 2006 “war” on drugs and organized crime, about 37,000 people have gone missing, according to the Ministry of the Interior, a number cited by Human Rights Watch. It was these statistics—and his pledge to end the militarized state response—that fueled Andrés Manuel Lopez Obrador’s victory in the 2018 Mexican election. Of these new funds, $5 million over two years (2019-2020) will support ongoing work to “advance criminal justice reform and Mexico’s new National Prosecutor’s Office, a critical component of a fair accusatory justice system.” The National Prosecutor’s Office has replaced the Attorney General’s Office, and was created after an intensive campaign by human rights organizations. Human rights groups argued that a new and more autonomous institution was necessary. MacArthur has also announced that these new initiatives represent its final commitment to human rights work in Mexico; it will close its Mexico office in December 2020. Since it began its work in Mexico, MacArthur has awarded more than 1,100 grants totaling nearly $200 million to organizations and individuals in Mexico, or whose work was intended to benefit Mexico. The decision to wind down this grantmaking came as part of the foundation’s larger strategic shift a few years ago to sharpen its focus in order to achieve greater impact, including through “big bets” to address some of the world’s most urgent issues. Ford’s Natural Resources work in Mexico and Central America moves beyond civil and political rights to address underlying issues of resource control, which affect both economic outcomes and longer-term issues of climate change. It aims to increase the control indigenous communities have over natural resources, so that “rural and indigenous communities shoulder less of the costs of extracting them (financial and otherwise), and reap more of the benefits,” according to Ford’s website. In addition to the economic benefits, Ford argues that giving communities greater control over land, especially forests, is the best, most cost-effective solution to climate change. It cites a study from the World Resources Institute, which shows that when communities have such rights, as well as incentives to manage the land, much less forest is lost—with the result being reduced atmospheric carbon. In 2018, we wrote about the $459 million grant by Ford and eight other funders to support indigenous land rights as a means to mitigate the consequences of climate change. In addition to these heavy hitters, the Fund for Global Human Rights also aims to advance human rights and the rule of law in Mexico, Guatemala, and Honduras. The fund uses a different grant-giving model than the big foundations: It prefers long-term general support grants to local activist groups rather than project-based grants, believing that “activists themselves know best how to allocate their resources,” according to the group’s website. The work of the fund’s grantees in Mexico and Central America spans civil, political, and economic and social rights. Several organizations are defending the rights of rural and indigenous communities and collecting evidence to build a case against Goldcorp mining company for causing grave health harms in communities in all three countries. The fund also supports the Center for Worker Support in Mexico, founded by Bianca Velazquez, a former maquila worker and founder of the first recognized union in the Mexican auto parts industry. In Guatemala, the fund works to promote the rule of law by making sure past and current perpetrators of human right abuses are held accountable. It also protects the rights of women and indigenous peoples to access land and other resources. Some of these funders—such as MacArthur and Ford—have been engaged in Mexico and Central America for more than 20 years, at least since the beginning of their democratic transitions in the 1980s. Given the enormous challenges that continue to engulf the region, especially around crime, corruption, impunity and human rights, it is hardly unfair to ask about the impact of these programs. After two decades of work, there must be a stash of program evaluations that would fill the Museo Nacional de Anthropología. Lacking the time to collect and read them, instead I asked Sharon Bissell, the director of the Mexico program at MacArthur, to reflect on the foundation’s achievements. In an email, she admitted that initially, MacArthur supported an approach to “strategic litigation” that bypassed national courts in favor of the Inter-American Human Rights system, but that beginning in the mid-2000s, the approach shifted to designing efforts to improve—rather than bypass—the national criminal justice system. “There have been significant improvements at the federal and local levels, yet threats to the reform continue, including recent legislation that augurs increased use of pretrial detention,” she wrote. Although the institutionalization of the human rights movement is an achievement, long ago Max Weber analyzed the rise and “routinization” of charismatic leadership and the eventual emergence of the “iron cage” of bureaucracy. The persistence—even escalation—of violent crime in Mexico may be a sign that the legalistic and now bureaucratized human rights approach is no longer the appropriate tool to confront these problems, and that a radical pivot in strategy is necessary. One thing is certain: If this crisis continues, Mexico and Central America may be vulnerable to the rise of charismatic, populist leaders like Trump—or like Jair Bolsonaro, Brazil's new far-right president who got elected promising a crackdown on crime.